Henry Vogt Heuser, grandson of our founder Henry Vogt was an exemplary corporate citizen and a gifted inventor and entrepreneur. He was a native of Louisville Kentucky who spent his entire career working for the Henry Vogt Machine Company, including 28 years as its president. Whenever he had an idea about how to make something better, quicker, or easier, all he had to do was walk out to the shop floor to assess its viability and commercial potential. Prior to his death in 1999, Mr. Heuser established the Vogt Invention and Innovation Fund to support the “Vogt Awards”. The endowment he created allows engineers and entrepreneurs to access the same kinds of resources as he did. The Vogt Awards are granted annually to help start-up ideas, products, and projects develop into viable and successful businesses that will provide economic growth, stability, and employment for the greater Louisville area (including Southern Indiana). We, the current employees at Vogt Ice are proud of the legacy established by Henry Vogt Heuser and invite you to view the following tribute. 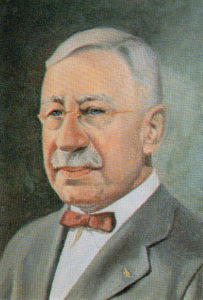 Henry Vogt was born in Louisville in 1856 to poor German immigrants. Shortly after becoming a journeyman machinist in 1880, together with his partner, opened a small machine shop on Main Street in Louisville, Kentucky. Specializing in general machine repair and the manufacture of freight elevators, he recognized that an engineered proprietary product would have numerous advantages over a general machine shop and soon established the reputation of “Building It Better”. During that same year Mr. Thomas A. Edison, a previous neighbor to Henry Vogt, was granted a U.S. patent for the invention of the first incandescent light bulb. In 1885, a boiler shop and foundry were added to the small machine shop for the manufacture of new products. This year marked the introduction of a new line of products used to make “artificial” ice – the Absorption Refrigeration and Ice Making Machine. This was just the beginning of the company we know now as Vogt Ice, the world leader in ice machine manufacturing. Weighing in at 83,000, the world’s largest ice machine was shipped from Vogt Ice to a power generation facility in North Carolina in 1994. Imagine the immense size of such a machine traveling down the highway to its new home in North Carolina. To clear the front gates of the Vogt Factory, the team had to let the air out of the truck tires. This mammoth machine, was capable of producing as much as 700 tons of ice in a 24-hour period. In contrast, the single largest Tube-Ice machine built today, the P42AXL (“The Ice King”), will produce 125 tons of ice per day. Engineers at the power generating facility found that by cooling the air that feeds the gas turbine generators improved the operating efficiency during peak demand periods. Engineers had used other air-cooling devices to feed turbines but determined ice was an efficient alternative. The ice makers work at night when power demand is lower, and recycle the water from melted ice to make new ice.